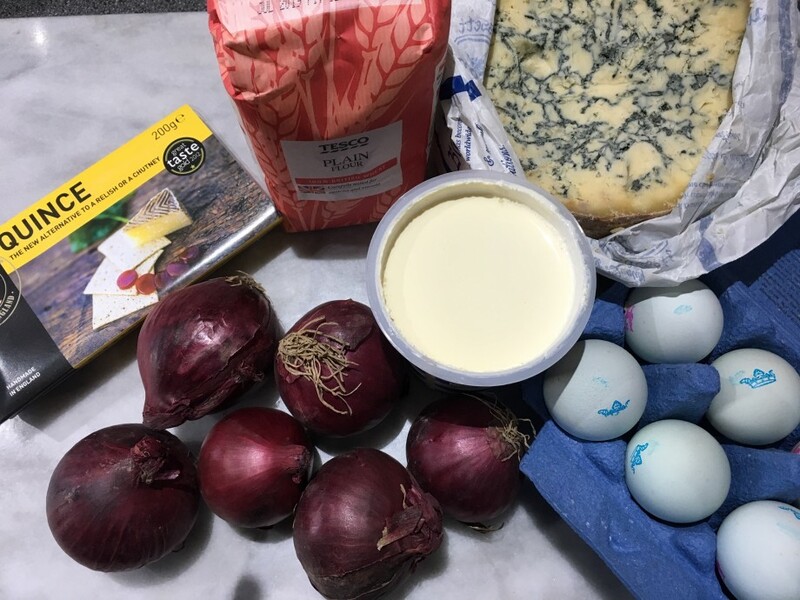 I am still getting through the festive baby Stilton and, although it is never a hardship to eat a crumbly morsel with some bread and pickle, I need to speed up the consumption of said cheese. This is a tart of winter flavours, set in a delicate wobbly custard. If you don’t feel like making your own pastry skip the first part and line the tart tin with shop-bought-but you’ll still need to bake blind the pastry for a crisp crust. Put the flour in a food processor and add the butter. Process to a fine crumb. Add two to three tablespoons cold water and pulse in short bursts until the dough starts to come together. Turn out onto a sheet of cling film and form a smooth ball. Wrap in the cling film and press out gently to form a flat oval. Chill in the fridge for 20 minutes. Place a sheet of baking parchment on the work surface and dust with flour. Unwrap the dough and put on the parchment but place a clean sheet of cling film over the dough- this will make rolling out easier. Roll out the pastry to a circle big enough to line a 23 cm loose-bottomed tart tin. Line the tart tin and prick the base with the prongs of a fork. Chill for 15 minutes. Heat the oven to 170˚c, fan oven 150˚, mark 3. Line the tart with baking parchment and pour in the baking beans (or whatever you use to weigh down the pastry). Bake blind for 25 minutes. Remove the paper and beans and return to the oven for a further 15-20 minutes until the pastry base is light golden. Brush the base with the egg yolk and cook for a further 2-3 minutes. Turn the heat up to 200˚c, fan oven 180˚c, mark 6. 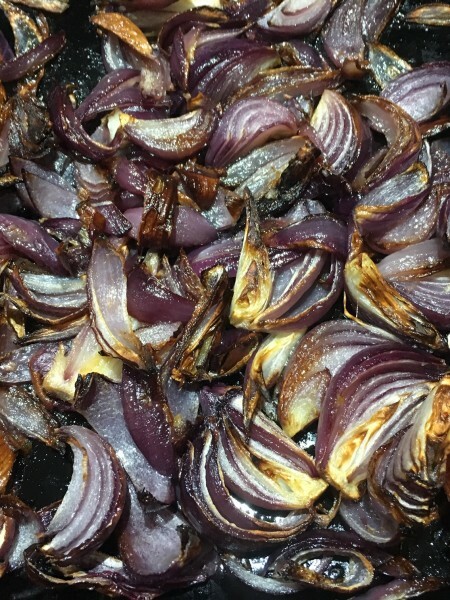 Put the red onions in a roasting tin and pour over the oil. Roast in the oven for 20 minutes. 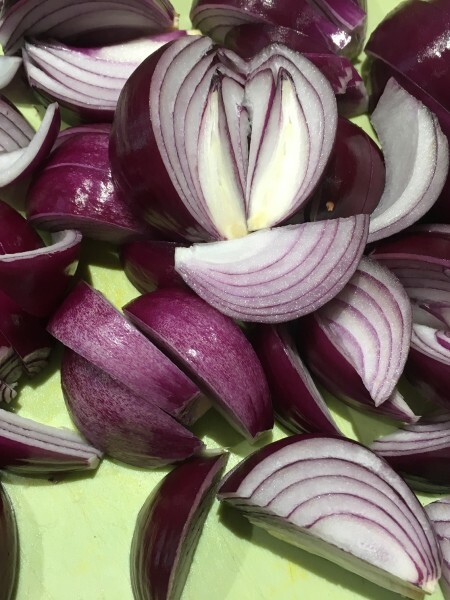 Stir the onions and return to the oven for a further 15 minutes. Cool for 10 minutes. Turn the oven down to 170˚c, fan oven 150˚c, mark 3. In a jug mix the eggs with the cream and season with a little salt and ground black pepper. 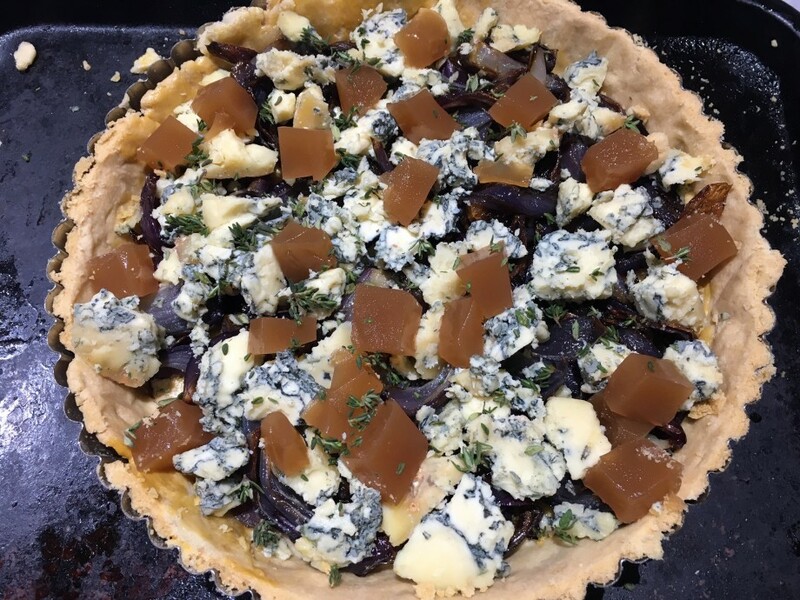 Place the onions over the base of the pastry and scatter over the Stilton. Arrange the quince cubes around the tart and sprinkle over the thyme leaves. 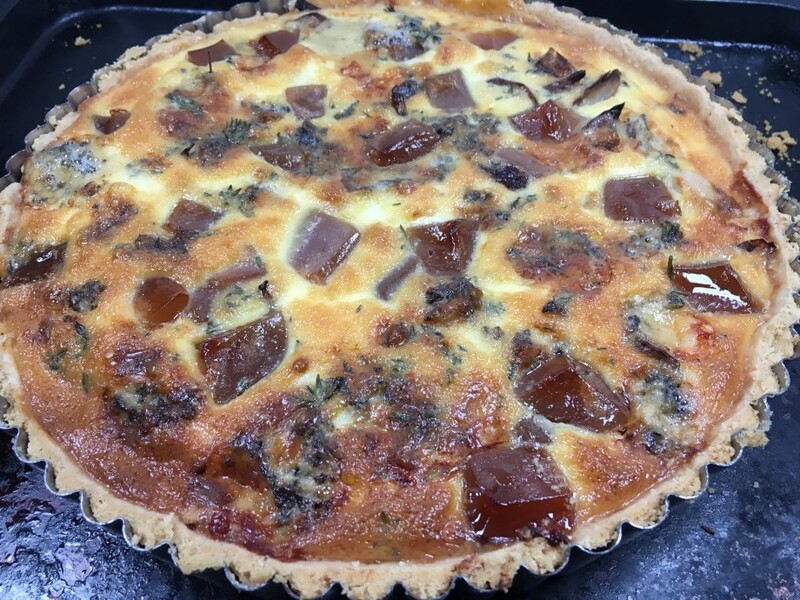 Pour the egg and cream custard into the tart. Bake in the oven for 25-30 minutes until golden and just set in the centre.